Donzi 28ZX single engine. Thoughts vs a 26ZX? Been shopping 99-01 26ZX's with a 502 and no salt water. Have found very few, as in 2 in the last 6 month's. Now, a single engine 99 28ZX is available on my home lake. It's a 454. From what I can tell, the 26 and 28 share the same hull. Anyone know for sure what the weight of the 28 single is? I have to be able to lift it on my 6500 lb lift (grandfathered dock, I cannot add a bigger lift). Any experience with the performance of a single 28? 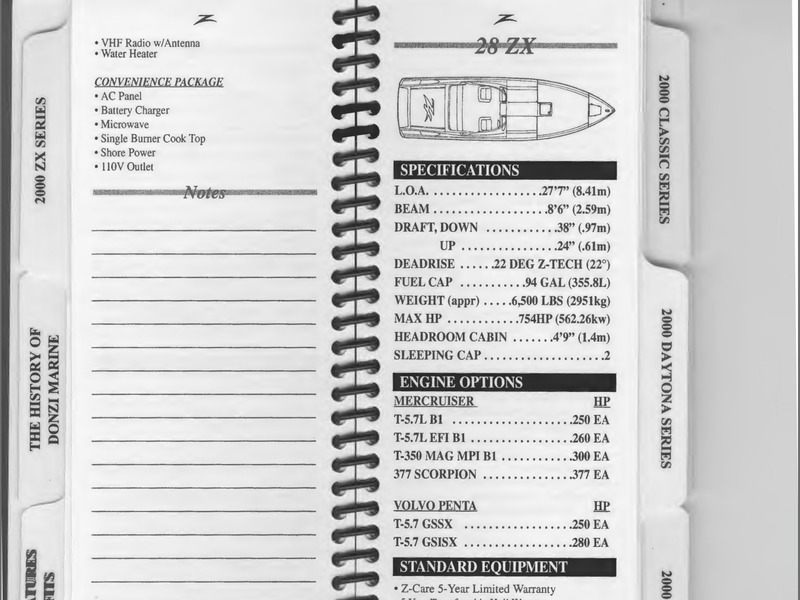 From the 2000 year owner's manual, I don't see the 28ZX single engine, the weight shown @ 6500lbs is the twin. Single obviously a bit lighter. No real experience in one but most people will say the 28 is sluggish with a single. It certainly won't jump up onto the plane and I'll have a guess, with a 7.4, a realistic top speed in the low 50's. I can tell you I test drove a 26zx with a 454 mag and it was dog, so I would imagine a 28zx would be worse ideal conditions maybe 60 mph. 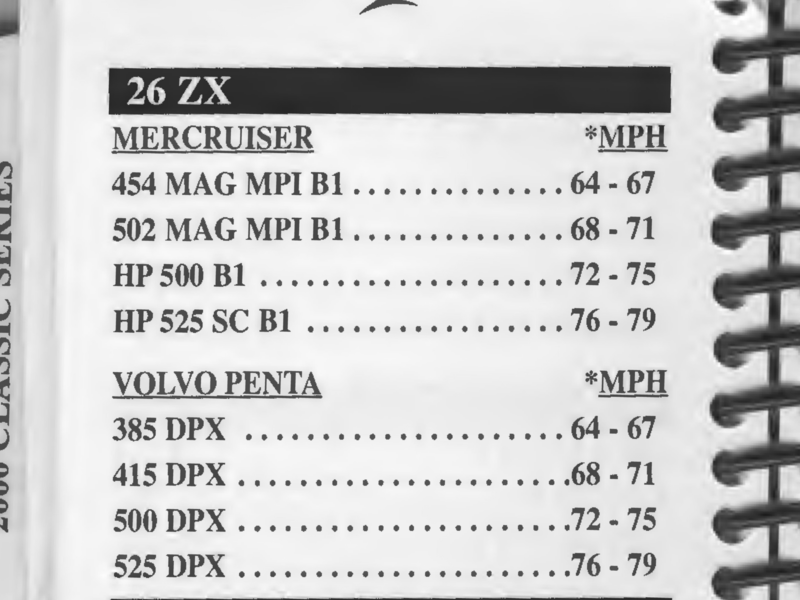 Also I remember hearing Donzi changed the 28 bottom to mimic the 26zx after it came out, I believe the 28zx after 2000 had lower hull modifications. Those speeds posted above are from ideal conditions and probably salt (1 to 2 mph faster usually) I can get 72 out of mine when alone and cooler weather. Most time loaded and hot out 68 to 70 with a stock HP500 and labbed 26 pitch bravo. Good luck on your search I was looking for same thing in 2010 and I looked for 2 years. There is very limited selection out there now and they are usually neglected or over priced. I think the boat market not making hardly any sport boats the last 10 years has really shrank what is available. The 26zx is kind of niche boat too works well as family boat, easy to trailer, and still fit in with the go fast crowd. Last edited by Donzi1979; 02-08-2019 at 11:35 AM. 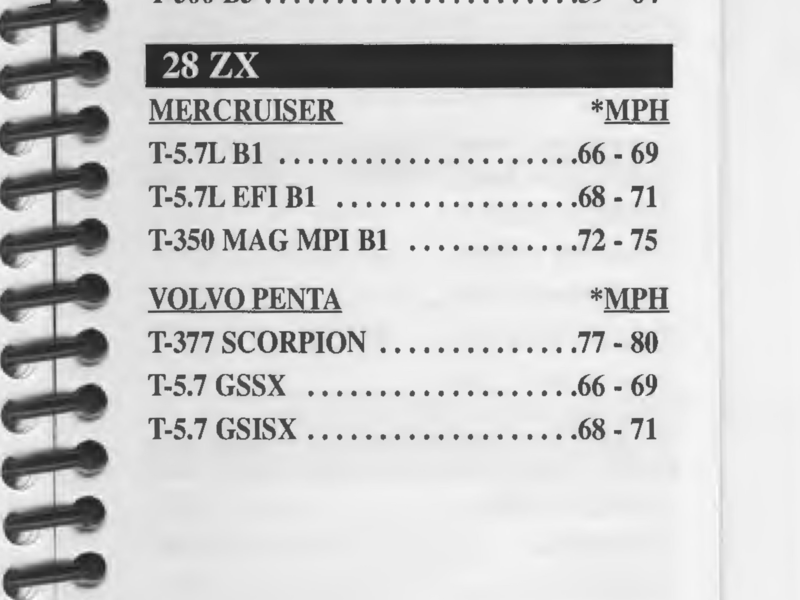 I did a lot of research into the 26/28zx, though I have a twin 28zx now that weighs around 8,000lbs wet, minus an engine/drive and I'd guess you'd be a bit over 6500 wet, so I think your lift would struggle with a single 28zx. 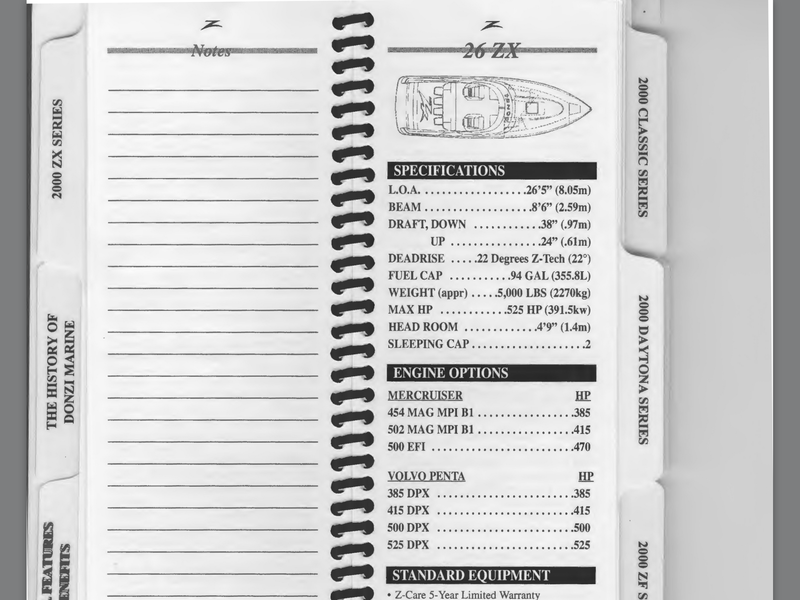 I'd keep hunting for a 26 with a good hull and plan on upgrading the engine after you buy one. 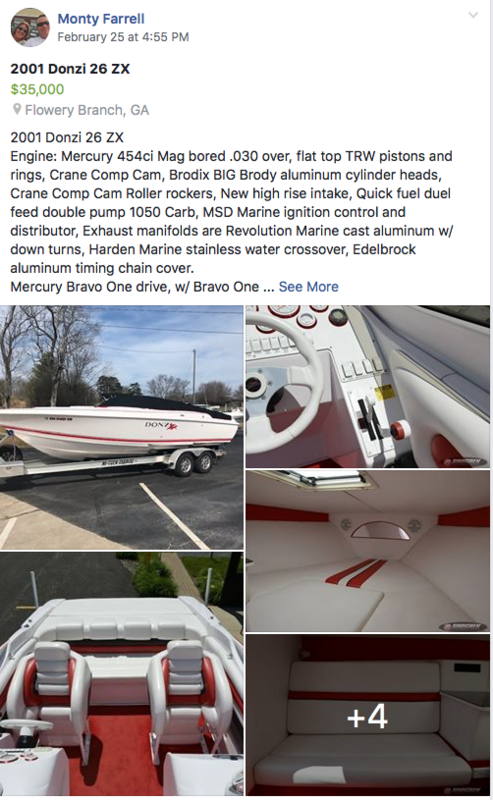 You can find some solid deals on rebuilds, but you'd most likely have to beef up your drive too, but that might be your easiest way to achieve a 70+ mph boat and stay under 6500lbs. Best of luck! Don't forget a 6500 pound lift is generally going to be rated at 50 percent of that number front and rear... i.e. 3250 front, 3250 rear. Almost any boat you buy won't have a 50/50 weight distribution so you are going to be WAY more limited on what you can safely lift. As an example we had a 20k pound lift put in for a Formula 34 PC which is a 13-14k pound boat dry.... and it broke the lift one day. The dock builder had to put in reinforced beams to make sure it wouldn't break again. IMO you are probably looking at an actual capacity of 5k pounds. When it comes to single 28's they really need a HP500 or bigger. The sweet spot on these boats is 45-55 MPH cruising and you aren't getting that with less power. Thank you. I prefer a stock 502. I know this is a Donzi thread and I don't want to irritate anyone but if you can't find the Donzi you want.......You may want to consider a 280 Velocity.